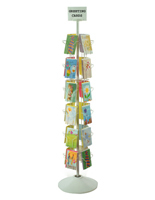 This Greeting Card Rack Accommodates 5"w x 7"h merchandise. This Storage Kiosk is 65-1/2"h and has 40 display pockets! 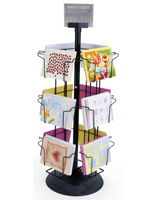 This Greeting Card Rack Makes it Easy to Rotate Merchandise and Has Custom Signage for Messaging. 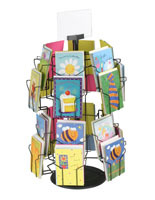 This greeting card rack is a great alternative to displaying merchandise on flat shelves. Designed with 40 pockets for greeting literature, this commercial storage is a unique way to house birthday, thank you, holiday and graduation cards. For a more specialized message, this greeting card rack offers a custom sign clip! This card stand holds 5"w x 7"h merchandise and stands 65-1/2"h. Use this greeting card rack as an ever-changing display for holiday and special occasion cards. This related sign clip allows you to change out the messaging whenever you like. 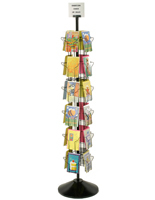 Changing out supplies is easier on this greeting card rack, wire shelving unit that spins on its base. 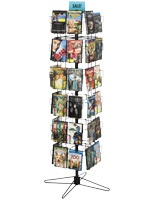 This retail display, card rack that is a spinning kiosk makes it easy for customers to browse through the headings. This kiosk, as an alternative to shelves, is inexpensive! The overlapping pockets on this unit that is wire shelving allows the customers to see a good deal of the face of each card at a glance. 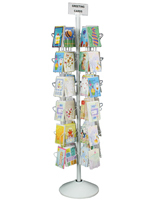 This greeting card rack, also known as a stationary display, has a white powder coated finish on steel wire. Don't worry about the unit tipping over, this unit has a sturdy plastic base. 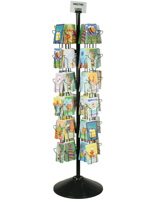 This greeting card rack is shipped unassembled, but sets up in minutes – no tools required!